A smooth, seamless transition began quickly this week following the resignation of Michael Melaniphy and the appointment of Richard A. White as Acting President & CEO. 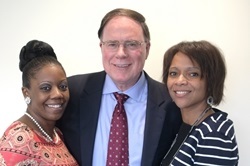 White had been serving as APTA's vice president for member services. His bio can be viewed here. Transition activities began at the Transit Board Members & Board Support Seminar in San Antonio last weekend. APTA Chair Valarie J. McCall and White were joined by Vice Chair Doran Barnes, Transit Board Members Committee Chair David Stackrow, and VIA Metropolitan Transit's CEO Jeff Arndt and Board Secretary Lester Bryant, all of whom communicated a message of continuity, stability and building for the future. > Government agencies and associations, including FTA, FRA, DHS and DOT, with follow-up planned for NTSB, as well as the U.S. Conference of Mayors, National League of Cities, National Association of Counties and National Association of Regional Councils. > Association partners and interest groups, including the Association of American Railroads, American Association of State Highway and Transportation Officials, American Road & Transportation Builders Association, AFL-CIO, Amalgamated Transit Union, Associated General Contractors, Conference Of Minority Transportation Officials, Community Transportation Association of America, Eno Center for Transportation, Mineta Transportation Institute, Transportation Research Board, Women's Transportation Seminar, Alliance To Save Energy, Rail-Volution and U.S. Chamber of Commerce, along with international groups Can adian Urban Transit Association, International Association of Public Transport, Union International des Chemins de Fer (UIC) and Union des Industries Ferroviaires Européennes (UNIFE). 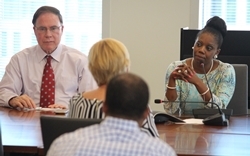 COMTO President Mioshi Moses (at left with McCall and White) visited APTA to discuss ways to continue working together. More outreach activities are planned, including meetings with key offices on Capitol Hill, as APTA works to reassure members and stakeholders that the association is on course to deliver excellence and meet priority needs. In preparation for the upcoming Bus & Paratransit Conference and International Bus Roadeo, an APTA staff team travelled to Charlotte, NC, this week to meet with groups that share our association's views on diversity and inclusion. Representatives of the Charlotte Regional Visitors Authority and Westin Hotel & Charlotte Convention Center expressed gratitude that we are holding the event in their city and assured APTA that they are prepared for our members' arrival. Equality North Carolina and the Charlotte LGBT Chamber of Commerce discussed with the APTA staff a variety of ways in which we could inform our members about the impact of the HB2 law, not just on the LGBT community but also for other groups such as veterans and people with disabilities. Both organizations will have a presence in our registration area and at the Product Showcase. Additionally, Equity North Carolina will participate in the newly-added Listening Session on Diversity. The APTA team also met with Charlotte Mayor Jennifer Roberts and Charlotte Area Transit System CEO John Lewis Jr., both of whom emphasized benefits that CATS is delivering to their city. We briefed the leaders on the conference program and APTA's plans to inform our members about non-discrimination workplace policies that have been adopted by other industries. "The DC Metro historically has been a great strength of this region," he said in response to a question at a White House press conference. "But it is just one more example of the underinvestments that have been made." The President went on to say that these types of infrastructure problems are being seen in communities across the country. He said Congress has been resistant to addressing the issue for years. Pointing to the benefits of the Hoover Dam, the Golden Gate Bridge and Washington's Metro, Obama said that investing in America's infrastructure "is a huge boost to the economy and it lasts a long time." FTA announced this week the availability of $8 million to fund innovative approaches to integrated mobility within a public transportation framework. The Mobility on Demand (MOD) Sandbox Demonstration Program will support research and technology projects that improve public transportation efficiency and effectiveness. The program is part of a larger MOD research effort at FTA and DOT that supports public transit agencies and communities as they navigate the evolving landscape of personal mobility. According to FTA, "Mobility on Demand projects and services help make transportation systems more integrated, automated and accessible, while offering better connections to both existing and future infrastructure, and public and private transportation options." Eligible projects could include smartphone apps, innovative fare payment and finance mechanisms, connected vehicles and infrastructure, shared-use and on-demand services, and a broad range of other mobility solutions. Existing FTA grantees such as public transportation agencies, state departments of transportation and Native tribes are eligible to receive funds under the program. Applications are due by July 5, 2016. For more information, including a detailed explanation of the selection criteria, visit Grants.gov. U.S. DOT Secretary Anthony Foxx has asked APTA to participate in his National Virtual Town Hall meeting on May 11 at 2:30 p.m. EST. This Web-based event, which is open to all APTA members, will highlight the integral role that transportation, particularly public transportation, plays in connecting people to opportunities. To RSVP, DOT asked that you fill out this form. Questions can be submitted using the hashtag #DOTConnections. APTA will have a high profile during National Infrastructure Week, May 16-23. A toolkit has been created to help APTA members promote the week's message in their local communities. It is available on the APTA website here. We also will host a national media call-in on May 19 with public transit system CEOs from around the country to spotlight their infrastructure needs. Watch for more news about activities for APTA members as the week approaches. "We believe in change and progress because that's what has made public transportation such a vital part of America's economy and culture. It's why I'm so optimistic about our future — as an industry and an association."